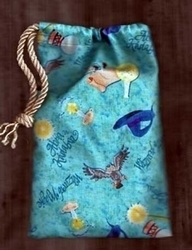 One of our personal favorites among all our tarot bags is Spellwork Tarot Bag. 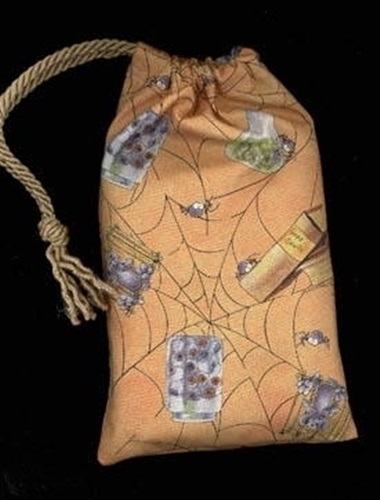 Against a light orange background you see cobwebs creep with spiders, a glass jar filled with eye balls stares back at you, and two thick books "Good Spells" and "Bad spells." Also shown are a caged mouse and a beaker full of swimming green slimy, wiggly things. Kinda makes you wanna hang around to see what this witch is brewing up! This bag is ideal for the Tarot card reader, witch, or wizard with a sense of humor! 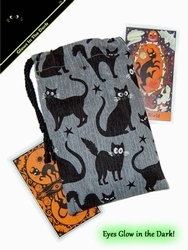 As always, our Tarot bags aren't just for Tarot cards! They are also perfect for protecting your collectible cards, cards for trading card games, RPG dice for D&D or other role-playing games, just about anything. 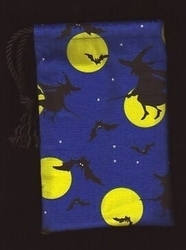 Size: Measures about 5 inches wide by 7� inches tall (approx. 13 x 20 cm). 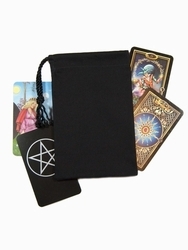 Fits most standard sized oracle or tarot card decks (3 in x 5 in and smaller). Please allow for slight, natural variations in size of the bag and pattern placement.